Devoted to desert flora, the 40-acre (16-hectare) Olive Pink Botanic Garden is home to more than 600 central Australian plant species, a network of walking trails, a visitor center with exhibitions, and the Bean Tree Cafe. It takes its name from its founder, the illustrator, activist, gardener, and anthropologist Olive Pink. Gain entry to the Olive Pink Botanic Garden by donation. Annie Myers Hill offers views over downtown Alice Springs, sacred land formations, and the usually dry Todd River, while other walks focus on native species such as wattle (acacia) and mallee, an unusual multi-stemmed tree. Walks are signposted, and plants are clearly identified, but some travelers may prefer the convenience of a tour that covers multiple desert destinations in one day and includes round-trip transfers. Olive Pink Botanic Garden is a must for nature-lovers. The garden can get hot, especially at midday in summer. Bring a hat, sunscreen, and a water bottle. The walking paths at Olive Pink Botanic Garden are dirt but generally wheelchair accessible. Annie Myers Hill is rocky and has steps. Just across the river from downtown Alice Springs, Olive Pink Botanic Garden is about a 1-mile (1.5-kilometer) walk from the Alice Springs Interchange bus station, or a scenic cycle ride along the Todd River. Public transport in Alice Springs is limited, so it's best to self-drive, walk, or join an organized tour. The Olive Pink Botanic Garden is open seven days a week, from early morning until early evening, closing only on Good Friday and Christmas Day. As with other Alice Springs attractions, it’s not usually crowded. In late spring, summer, and early autumn (roughly October to mid-April), visit early in the day or late in the afternoon to beat the heat. The sheer variety of life that survives the harsh conditions of Australia’s desert is a highlight of the Olive Pink Botanic Garden. 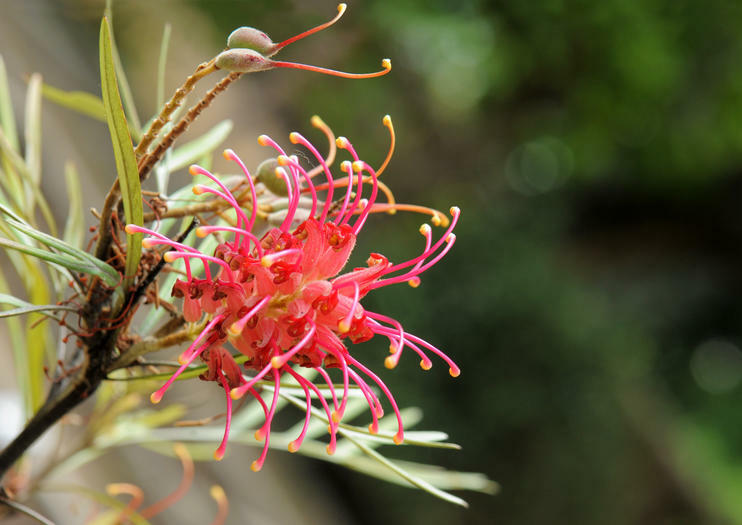 Bush tucker, or native edible plants, are increasingly coming into vogue in modern Australian cuisine, and the garden’s selection includes quandong and native lemongrass. Also look out for euros, also known as wallaroos, a marsupial halfway between the kangaroo and the wallaby in size.